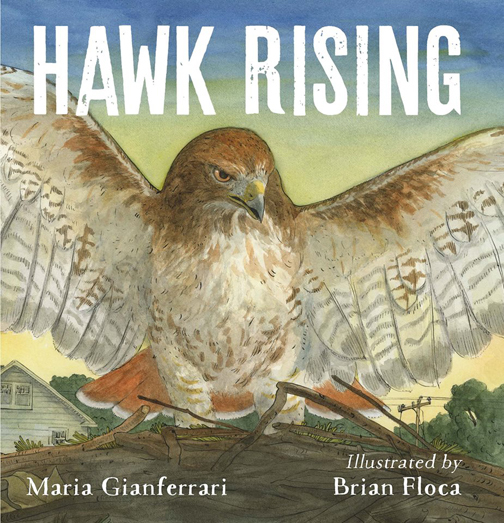 Hawk Rising by Maria Gianferrari, pictures by Brian Floca. Roaring Brook Press, New York, NY, 2018. “Father Hawk stretches wide his wings. You stretch your arms as Mars rises red in the sky.” Hawk Rising begins and ends with both Father Hawk and a little girl waking up. Hawk wakes up knowing he must search for food for his new-born chicks. The little girl watches that search from afar. This beautifully illustrated picture book captures the essence of the life of a hawk and its struggle to feed his chicks. The poetic text describes both that struggle and the curiosity of the little girl, who watches using her trusty binoculars. Floca’s realistic illustrations depict the fierceness of the red-tailed hawk: “Hooked beak, sharp as a knife.” Even the chicks are not particularly warm and fuzzy. Father Hawk spends an entire day looking for food for them. “Daylight blinking. Chicks waiting. You fading.” Father hawk still has not found food and the reader wonders if the chicks are fading too. As night falls, he finally traps a squirrel that was just a little too slow. The juxtaposition of the Hawk’s search and the little girl’s observation keeps the story moving along. The spare, poetic text should appeal to the youngest child sitting on a lap. The glossary will appeal to teachers and older children curious about birds and the way they live. This is an excellent book for the classroom science collection and would also fit well into a poetry unit. The artwork is perfect as inspiration for art lessons. The author thanks the Cornell Lab of Ornithology for its work on behalf of birds (see November post, On Duck Pond by Jane Yolen). The illustrator thanks the Horizon Wings Raptor Rehabilitation Education Center in Connecticut, where he undoubtedly was inspired to draw such striking and realistic illustrations of hawks. Whoa! I guess I’ll have to fix that! I am a middle grade writer: Two of my historical novels were published by a regional press here in WI. See http://www.CrickhollowBooks.com I am working on a picture book–no bites yet–and have another MG with my editor at this time. Thanks for reading my blog! I loved Hawk’s Rising!